Does Your Staff Need a Lift? Has your school staff morale been low? Are you a tight knit crew or more of a "just get it done and go home" type of colleagues? Do you wish you enjoyed your work environment a little more. 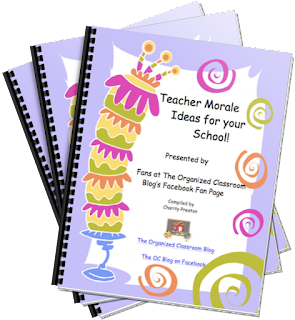 Check out this article to get some fun ideas - and a freebie! This originally appeared on Organized Classroom. 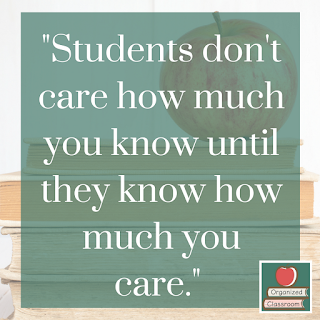 Teacher morale is about feeling valued and appreciated in every aspect of their profession. Feeling proud of being an educator and knowing he or she is making a difference (and being told that frequently) ensures job satisfaction. It really isn't any different than any other job role to want to feel appreciated. Now, more than ever, teachers are filling a job that is so multi-faceted, there are few who are even interested in stepping up to the plate to do it. In any given day, a classroom teacher may have to fill a role of educator, disciplinarian, confidant, character builder, food provider, task master, nurse, housekeeper, and so much more... While formal professional development sessions are wonderful for teaching staff how to do many of those roles, sometimes just a pat on the back and some kind words are really what teachers need the most. Everyone wants to feel like they are serving a purpose in the work they do. 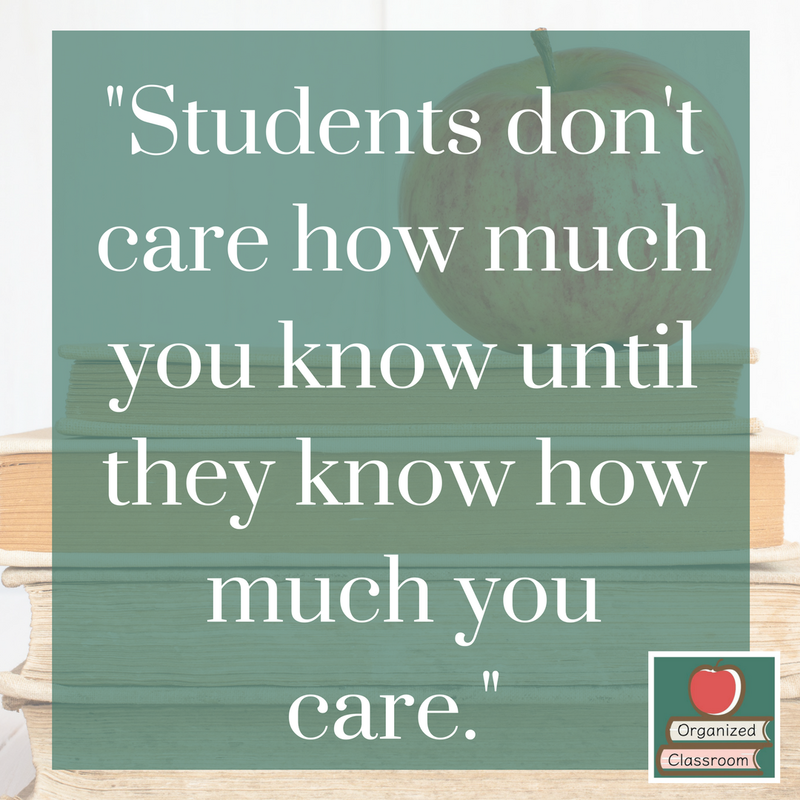 One of my favorite quotes that I have always tried to remember within the classroom when working with students is: "Students don't care how much you know until they know how much you care." It's also applicable when coming up with staff morale ideas too. Need some quick solutions to make other staff members smile again when the stress of the job is becoming a little too much to bear? These ideas are not only for administrators to implement with their staff members, but some can also be done by teachers for teachers. Don't forget about support staff - they help keep the buildings running as a cohesive unit too! 3 - Sunshine Club/Social Committee ideas: Most schools have a group of staff members who are in charge of spreading love throughout the workers. Get involved and encourage little ways to say thanks more often during the school year. Don't have a social committee at your building? Start one! 4 - Potlucks in the staff lounge: Everyone has to eat. Do a monthly meal when everyone brings something to share. Baked potato bars, cookouts, desserts, or soup/salad buffets are tasty and offer a way to try new recipes from other employees. Have a sign up sheet about a week prior so everyone gets a chance to contribute. 5 - Staff member get togethers outside of the school environment: One of my favorite things about a grade level staff I worked with when I taught in Florida was the weekend meetups our grade level team regularly had. We would do lunch, shopping, or sometimes even cocktails. The annual cookie decorating event at Christmas was always something we looked forward to each year. When I noticed that a Facebook fan posted this on the Organized Classroom fan page: "My principal has asked our building to work on morale among teachers.....looking for some fun/creative ideas some of you have done at your buildings!" and that there was a whole thread of ideas, I knew it warranted a free eBook, which is exactly where the one below came from. Stop at Organized Classroom to download it right to your email! Enjoy and hopefully some of you who have schools with some low morale right now, can use one or two ideas to break up the dark cloud a bit and let the sun shine in. Don't have a super supportive principal? You don't need permission to make a colleague smile. Find little ways to make their day brighter and in turn you'll find it helps you in the process as a nice side effect. Have fun and thanks to all the contributors!